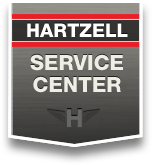 Hartzell Service Center | Hartzell Propeller Inc.
Our Hartzell Service Center is an FAA-Certified Repair Station (SJ3R843L) focused exclusively on our product line. If there is a Hartzell product you need serviced – whether you have a 2-bladed metal propeller or a 6-bladed composite system – our understanding of all things Hartzell is unparalleled. We provide high quality repairs and overhauls in short lead times at a competitive price. When we overhaul your propeller, the finished propeller will look like new, as we utilize the same surface treatments as the factory where your propeller was manufactured. We invite service center customers to fly in or take advantage of our regional pickup and delivery services. These services aren’t limited to geographical boundaries. We are happy to ship to customers around the world. Additionally, we also offer an exchange program for customers whose demanding flight schedules require the ultimate in convenience with minimum downtime. Fly in customers can also take advantage of Ohio’s sales tax exemption for general aviation aircraft and our specialized dynamic propeller balancing service for the ultimate in smoothness. Need some more guidance? Visit Questions to Ask Your Prop Shop. When you are ready to demand the best for your aircraft, contact us.